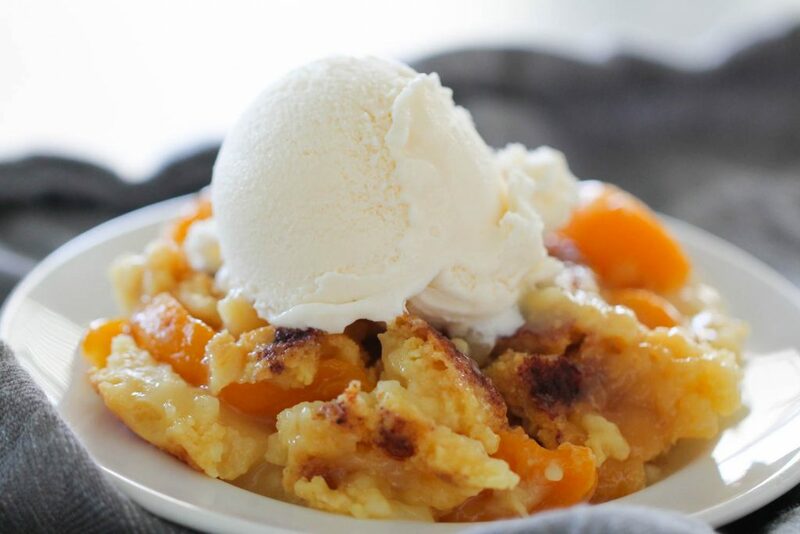 With only 4 ingredients, you can dump this recipe into a pan and have a warm Peach Cobbler Dump Cake in no time at all. Filled with peaches and a buttery topping made from a cake mix, you won't be able to resist this dessert. When I need dessert in a hurry, this Peach Cobbler Dump Cake is my go-to recipe. It literally comes together in a matter of minutes and is so simple that my kids can make it. This cake can be made year-round because it uses canned peaches (it doesn’t get any easier than that!) and a simple cake mix. 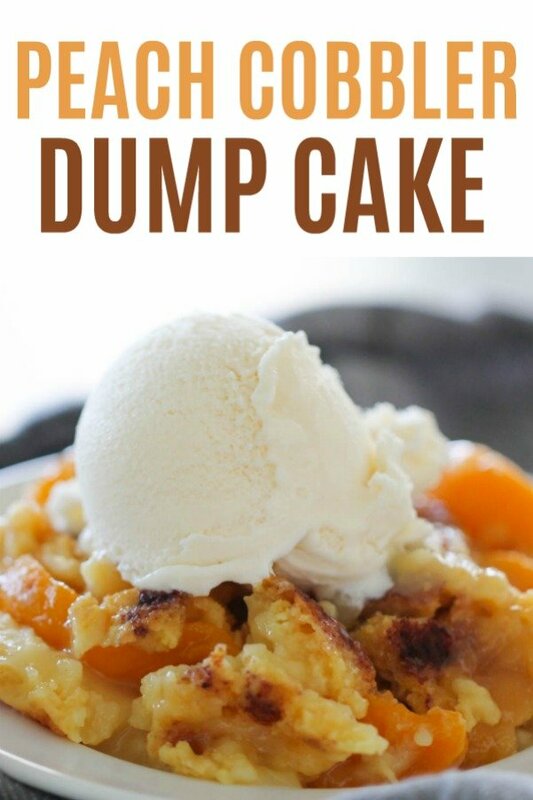 What is a dump cake? A dump cake is the simplest dessert you can make – it usually has a base of a cake mix plus fruit filling. You dump all the ingredients into the pan, stir them together (in the pan! No bowl needed! ), and bake. For this Peach Cobbler Dump Cake, you don’t even have to stir all the ingredients together. It really is a dump-and-go dessert. This dump cake reminds me of a cobbler because of the way the crust gets crispy on the outside, but it stays warm and soft on the inside. It started with this Peach Cobbler Dump Cake, but then branched out into our Pumpkin Dump Cake, and then we made an Apple Cider Dump Cake, and took it a step further with our Apple Raspberry Dump Cake. They are all so delicious – it’s making me hungry just thinking about them! Dump peaches in bottom of a 9×13″ pan. Sprinkle dry cake mix on top of peaches. Cut butter into small pieces and place on top of cake mix. Sprinkle with cinnamon and bake! We love to serve this warm with a scoop of vanilla ice cream on top. It’s the perfect dessert! To save time, some of our readers have melted the butter and poured it over the top of the dry mix – either way will work just fine. If you are having problems with the cake being too dry, before you bake the cake, press the cake mix down into the peaches to help combine the dry mix with some of the moisture with the peaches. 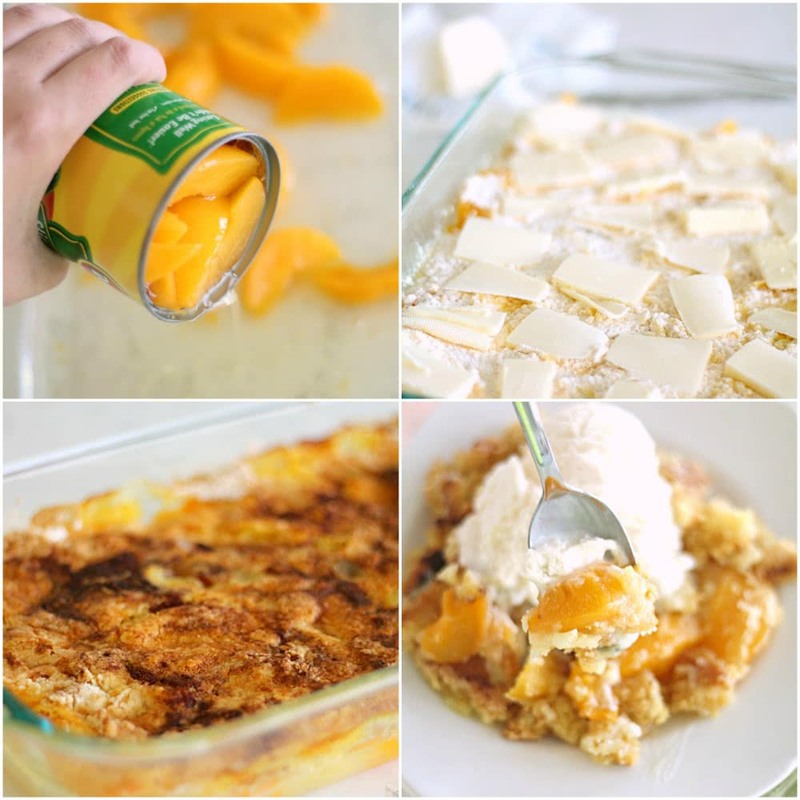 This peach cobbler dump cake only takes 4 ingredients and is so delicious! Empty peaches into the bottom of a 9x13-inch baking pan. Cover with the dry cake mix and press down firmly. Serve with vanilla ice cream, if desired. This is one of our favorite recipes to make in the dutch oven. and we always do the easy route too, cake mix and canned peaches, and butter. Yummy! I would thaw your frozen peaches before you bake. Same problem. 2ingredient cake doesn't stay open. What gives? You cook this for 45 minutes. It's in the instructions by the full recipe ingredients and directions. As I was reading, I totally remembered BBQs at a friend's house. Her family loved Dutch oven cooking so much they had a pit in their backyard specifically to use them. Basically a sandbox lol. This is the exact recipe they wrote down for me. Nothing says summer like Peach Cobbler. This version looks wonderful! This looks so good! I'll be attempting it soon. Thanks for posting! hmm. i think i have all these ingredients in the house right now... thanks for the recipe! Growing up we used a similar version of this recipe, and we called it Poor Man's Pie. 1 large can of peaches in heavy syrup, 1 box white cake mix and 1 stick of butter sliced in top. Didn't need to press down, just spread out the cake mix. Pop in the oven at 350 for 45 min. One if our favs! I'll try cinnamon next time! The cinnamon just give it a little personal touch !!! We use this same recipe all the time. It's the best! Also, if you are camping and forgot the cinnamon, substitute with Hot Tamale candies. I almost prefer it. :) My husband went to the DR too. I want to make this for church on Sunday. Do I need to use stick butter or will tub butter work? Tub butter would work just fine. Hope you like it! I'll bet this will be good with pineapple, too. Maybe leave out the cinnamon. wait so do you pour the peaches in with the liquid and all or just the peaches? Pour in the peaches AND the liquid! Hope you like it! I prefer a little bakery trick I know. Drain the liquid off te peaches into a bowl, mix a few tablespoons of flour and a tsp or two of cinnamon into the juice before pouring over the peaches. Then dump your dry cake mix and top with butter. It gives the bottom layer that creamy, tangy peach cobbler texture. An equally awesome twist on this is 2 cans of strawberry pie filling with a chocolate cake mix! We call it chocolate covered strawberry cobbler. Going camping this summer and we are bringing a dutch oven. 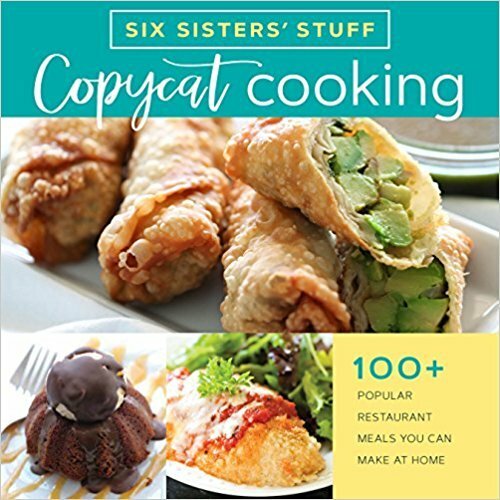 Would it be possible to get the recipe/directions for your late father-in-law's version? We do this while camping in a dutch oven. It's so amazing. I mix in just a bit of the cake mix into the peaches, then put the rest on top, dot with diced butter and sprinkle with cinnamon. We cook it over fire coals, put some on top to cover the lid and baked it for about 40 minutes. Comes out with a crunchy top, and served it with ice cream since we were in a trailer. We haven't been able to track down any of his recipes. :( I think a lot of them were in his head. I found this one that looks really good and has a 5 star rating! I've made it with peach pie filling or cherry pie filling minus the cinnamon - works perfect too! Super easy! My fave is with cherry pie filling and crushed pineapple together. I also add walnuts on top. You can also mix some rolled oats with the cake mix and it makes it a little bit of a different topping. I just found your blog through Pinterest. Wow, six girls, how wonderful!! I was blessed with 3, and I was thrilled. No boys, but I have 2 grandsons. All I can say is, you are ALL beautiful, and your parents must be so proud!!! I know I would be!! We called this Cherry Quick Cake, growing up. You mixed one can of cherry pie filling with 1 small can of pineapple tidbits. Spread that in a buttered pan, and then top that with the yellow cake mix and melted butter. It was so, so rich and sweet. As kids, we loved it. Now, it's a bit too sweet for me. You can really get by using only 1/2 a cake mix, or, just use one of those small jiffy boxes of yellow cake that make a single layer -- perfect amount. A friend from New Orleans gave me this receipe with apples. it had a brown sugar, butter and oatmeal topping. My Texas born Grandma used to make it with cherries with a crumble topping to. Delicious! I am just in the mood for this tonight after a rough day.Fabulous post, thank you. I was thinking the same Lexie... rough day calls for a sweet treat ! I’ve got peaches, cherry ? pie filling, and ? apple pie filling.. which to use, which to use ? ? ??? I'm trying this with fresh strawberries and blueberries mixed with splenda and sugar free cake mix. I'll let you know how it turns out. It was DELICIOUS! Thanks for the idea! If I don't have a dutch oven, could I just use a greased baking dish? and bake it in the oven? I actually just used a baking dish and baked it in the oven. Just follow the directions and it will walk you through it. Thanks! This was the best Peach Cobbler recipe ever! My daughter's boyfriend told me he had a "foodgasim" from eating it...my daughter was in heaven and when I came out the next morning, more than half the pan was gone! I tried this recipe over the weekend and it was amazing. I strained the peace juice and added corn starch, brown sugar and cinnamon. This made the peaches really flavorful and thick. Highly recommended. And so...so easy! Another quick one is frozen fruit, cake mix, and sprite. Layer each without mixing and bake. It's amazing. We've done both peaches and blackberries so far. Cool thing is that it's just three ingredients and you don't even thaw the fruit first! Frozen fruit, a 1/2 c. of sugar, a cake mix, 1 T cinnamon, and a stick of butter works great, too. Bake at 350 for an hour. We call it dump cake. It's AWESOME with blueberries! Making this tonight (using cherry pie filling instead of peaches) for Father's Day! Thanks for sharing!! Can't wait to make this! I <3 Cherry Dump Cake so I am sure I will LOVE this! I love dump cakes!! My 5 year old helped me make this tonight and she is sitting in her little chair looking into the oven waiting for it to be done! Priceless. This was so easy, and so good!! Thank you so much for sharing this recipe! My 5 year old was able to do this all on her own (besides cutting the butter) and was so excited! Doesn't hurt that it's delicious to boot! Would this work in the crockpot? I think you could definitely do this in a crockpot! Let us know how it goes! Another great 'tweek' to this recipe is using 1 pouch of instant cinnamon oatmeal (b/c I was out of plain oats) sprinkled on top of the cake mix and then press down firmly on both. I still sprinkled the top with a little cinnamon after adding the butter. My family loves the added texture that the oatmeal adds, but your basic recipe is amazing all by itself! Thanks a bunch!!! Could you use fresh peaches instead of canned? I have never tried it with fresh peaches so I am not positive how it would turn out. My only concern is that it would be too dry because you pour in the whole can of peaches AND the juice. If you used fresh peaches, I would add some sort of liquid so it wouldn't come out dry and crumbly. Sorry I am not much help! Just wondering if you used the fresh peaches and how it turn out. I'm thinking of adding sugar to my sliced peaches to get the liquid needed. Let me know if you have any suggestions. Hi y'all -- My mother's mother made this from as long back as I could remember, then my mother made it when she moved from Texas to Bama. Now, I make it for my hubby's family and they are amazed every time - --- We do have a few differences though. Cake mix dumped in pan, sprinkled with coconut, stick of butter cut up on top and bake for about 20 minutes. Add cans of peaches (fresh work if you make enough juice with sugar), 1/2 cup sugar (or not, depending on sweetness level desired), sprinkle with cinnamon, and mixed one egg into 8 ounces sour cream and drizzled over the top. Bake at 350°/375° until bubbly and brown, 30 to 45 minutes or so. Oh man, I couldn't believe how good this was....especially considering how easy it was to make! Thanks for the recipe! One question...do the leftovers need to be refrigerated? Yes... I would refrigerate them! I used one can of apple pie filling, cake mix and one stick of margarine. Yum! Top with whipped cream or ice cream while warm and it is out of this world! Hi there! I'm planning to make this for a weekend getaway with friends, wondering how many servings does this make? There will be 11 people there, and I wasn't sure if one batch would be enough? Thank you! Why does it need to be pressed down firmly? That's what the recipe directs. Tastes yummy!! Could I use fresh peaches? We have never tried it with fresh peaches so we are not positive how it would turn out. Our only concern is that it would be too dry because you pour in the whole can of peaches AND the juice. If you used fresh peaches, I would add some sort of liquid so it wouldn?t come out dry and crumbly. Might be a novice question...should I drain the peaches? Thanks! Loved it. I used thawed frozen peaches and added 2 tablespoons of sugar. Worked great. The best and easiest recipe ever. I made this for a birthday dinner and it was a classic! So good! I WoulD Like To Try With 7Up. Can Someone TelL Me The PRoportions FoR The Fruit Dump Cake. Thank You In ADvance. Can this be done with any kind of canned fruit? We have only made it with peaches, but I'm sure any fruit would work. I just made this and a lot of the cake mix stayed dry. The cake mix I used called for eggs, oil and water to make. Should I have bought a different cake mix? If there such a thing as a complete mix (like the complete pancake batter that only needs water)? We have also made it melting the butter and drizzling it all over the dry cake mix. That may give you more coverage. We have fresh peaches coming out our ears! Would they work, rather than canned? I only have a can of peaches in 100% fruit juice...Can I still use that? Or would I need to add something else to it? Your peaches should work great! Was wondering if this would work ok with light canned peaches? I made this last night for my husband and a couple of friends.....they all said it was the BEST peach cobbler they'd ever had!!! I did add a few more fresh peach slices to fill the bottom of the dish as I couldn't find the size can called for in the recipe. I followed the rest of the recipe exactly. The bake time was perfect, this was super simple with outstanding results. Thanks for sharing! Only had a spice cake mix on hand-turned out so yummy!!! Perfect recipe, easy and tasty!!! My cake was way too wet. When I took out of oven it was not set. Kept adding 10 minutes to get it to set. The cake was dry. What happened? Has anyone ever tried this with light butter or tub margarine? I am on Weight Watchers and I trying to make a lighter version. I love the original version. I have read every single comment and can't wait to try this. I have sugar free/carb free cake mix. Just need a trip to the store for the fruit. I sure hope this works! Thanks! Want to try this but why use a DRY cake mix? Can I mix the cake mix as I would normally and place the preaches on top of the batter? I want my cobbler to have cake-like parts with the fruit. I was puzzled why sprinkle DRY cake mix instead of a normal cake batter. Someone else had asked this but received no reply. Hope someone can help. We've made this with our Girl Scout troops when camping -- using Dutch ovens. Our "timing" is when you smell it, it's done! We've used chocolate cake mix with cherry pie filling to make "black forest cake" . We all love Dump Cake recipes for fast, easy desserts! Would anyone know how I could make this very recipe in a jar (acutally, many jars) without loosing quality - taste, crispy, eye appeal. In our Church, we´re always in need to raise funds for homeless children and this is something we could make and sell all year round! Probably easier than our bake sale! Could I cook two 9x13's in the oven at the same time? We have done that before and it works just fine. Just check it to make sure it's done all the way! Couldn't get the ingredients or directions. This was a quick, yummy, dessert! I used three cans of pie filling, drained one, and cut the peaches into smaller pieces (each slice into 1/3rds). I also froze the butter ahead of time, then grated it over the top. This worked beautifully to get an even distribution and makes sure there are no dry spots. Also, make sure you 'pat down' the cake mix before adding the butter (I used the back of a measuring cup). This helps make sure you don't have any dry spots and all the cobbler topping cooks up nice and crumbly. I served with vanilla bean ice cream. My guys are super decadent and added caramel syrup and whipped topping!! Oh my stars. This recipe is so good. It smells amazing when baking and tastes even better once it's done. I did add one pouch of instant cinnamon apple oatmeal to the top. My picky eater son just inhaled his serving. :) That's a good day. I have canned peaches in water not syrup. is that ok? Please help me to sign up for your email update recipes. Cant find how to sign up on this page. If you can please sign me up using my email above. If you can't, please let me know how. Thanks. Love this site. I have five sisters and can relate to you. It should still work just fine. I was wondering if the could be done with a raspberry filling ??? My husband loves raspberries and we use to have a raspberry combler at Red Lobster years & years ago ..... has anyone tried this??? I have seen where some people were using apple and cherry pie filling. Can anyone let me know?? Looking for more of your recipes for crock potreceipts. Would this work with a gluten free cake mix? This was sooo easy and delicious! Im all about easy lol. How do I adjust this for a high altitude area? Wish you would put nutrient grams on recipes . Like fat, cholesterol and so on. Re: Peach Cobbler recipe: I don't go to all the trouble of cutting the butter up into little 'pats' to place on top. I just melt a stick of salted butter & drizzle it all over the top before sprinkling cinnamon over it all. It looked so delicious, but when I did it the recipe did not come out as expected. I followed the steps exact and I'm a pretty good baker, but when it was done 80% was still dry cake mix. The butter dried up and below it was dry. I don't know if being in a high altitude messed with it, but It was no good. ? So I am doing an experiment since I did not have 2 16 oz. Cans of peaches. I have put 1 can of peaches and 1 can of pears. I didnt have a yellow cake mix either so I am using a Krispy Kreme cake mix I bought at the dollar store. My fruit was not in heavy syrup because I always buy it with light syrup. And I added nutmeg with the cinnamon just because I tend to add nutmeg to everything sweet. Here's hoping it all turns out . Thanks for the basics to bake.